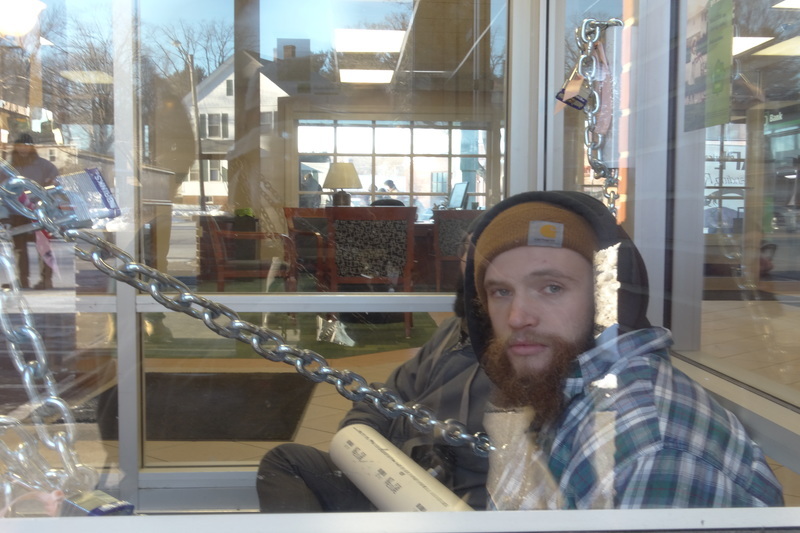 AMHERST — Demonstrators secured themselves with chains and PVC pipes to the entryways of TD Bank in downtown Amherst Friday morning as a form of non-violent direct action against the bank’s current investments in the Dakota Access Pipeline (DAPL). 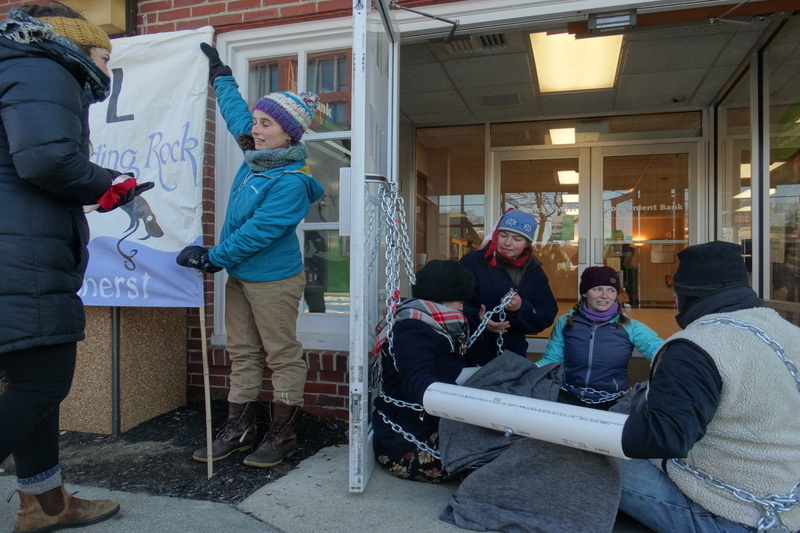 Protesters arrived in the frigid morning temperatures at 8 a.m. Five members occupied the two entryways to the bank, securing their bodies with heavy steel chains and padlocks to the door handles, making entrance to the business impossible. Those who did not lock themselves provided support, giving hot beverages and food to each other and those locked inside, and communicating with TD customers and police who arrived on the scene shortly. Despite the recent statement from the Army Corps of Engineers stating that they would not approve the pipeline through Standing Rock Indian Reservation in North Dakota, Energy Transfer Partners (ETP) released a statement saying they will drill anyway. With that, tribal leaders have encouraged local community action, according to an event organizer, who wished to remain anonymous. Katie Cane, a Smith College alumni and organizer, feels the actions by the army are not enough. “The action by the Army Corps of Engineers does not hold corporations accountable,” Cane said. The main entrance was blocked by three individuals: Marc Osten, Aly Johnson-Kurtz and Giovanna Castro. The trio sat in a triangle, hands linked beneath tubes of plastic piping for five hours. Paxton Reed, a University of Massachusetts Amherst freshman, and Harrison Greene occupied the back entrance. Throughout the incident, there were conflicting claims about nationwide action. Kurtz made mentions of similar events occurring all over the United States, while Cane said that she was not aware of any similar actions simultaneously linked to the local TD occupation. Lieutenant Gabriel Ting of the Amherst Police Department says he’s sympathetic to the protesters’ concerns. He noted, however, their methods were not legal and in his opinion, ineffective. Several bank customers were especially unhappy. Throughout the over five hours of occupation, multiple customers approached the door, were informed of the situation and promptly turned away, many of them uttered curse words under their breath. Kathleen Firth, a TD Bank customer and a British citizen, was in a rush to catch a flight home. Despite the disagreements, relations between police and protesters were friendly. Police respected protesters’ space, and non-chained protesters offered the officers coffee and food. After five-and-a-half hours, however, it was time for the police to end the demonstration. Police and firefighters were let into the building by employees through a side door. The fire department then cut a window out in the entryway to reach the three-person group and cut the chains with heavy duty bolt cutters. Once the chains were broken, police apprehended the chained-up protesters. Four of the five members who had sat in the doorways were arrested. One unchained herself before the other arrests were made. Employees of the Amherst TD Bank declined to comment.